Today is the day! It’s Rocker Stalker’s CMJ kick-off at Spike Hill in Williamsburg! 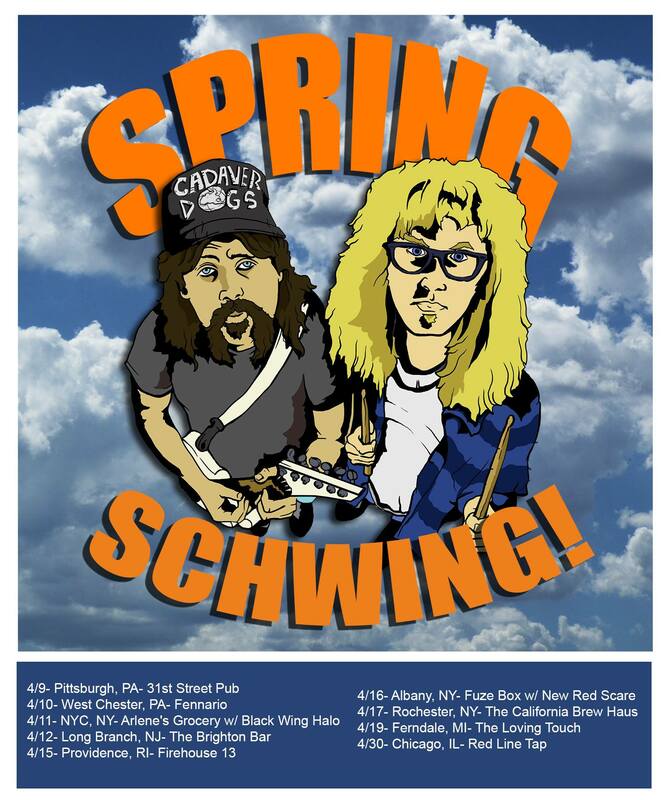 The “Wake the Rock Up” showcase features Shady Elders (CO), The Tye Trybe (NY), Crush Distance (NY), Cadaver Dogs (OH), The Phuss(TX), STRNGRS (NY), and Black Wing Halo (NY) and It’s a FREE! Doors at 12pm, runs til 6pm! Check out the Facebook invitation for set times! WWRSD? : ROCKER STALKER PRESENTS….3 OFFICIAL CMJ SHOWCASES! 10/16, 10/17, & 10/19! Greetings music lovers! It’s that time of year again when bands and music industry folk infiltrate New York City for the annual CMJ Music Marathon! This year, Rocker Stalker is taking the “marathon” very seriously, with THREE official and amazing showcases featuring top bands from five states! 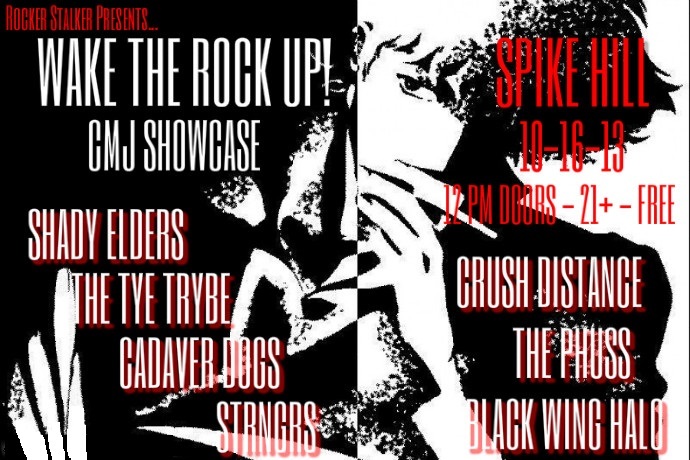 First up, on Wednesday, 10/16, the “Wake the Rock Up” showcase features Shady Elders (CO), The Tye Trybe (NY), Crush Distance (NY), Cadaver Dogs (OH), The Phuss(TX), STRNGRS (NY), and Black Wing Halo (NY) at Spike Hill in Brooklyn. It’s a FREE day show from 12pm-6pm. Check out the Facebook invitation for set times! 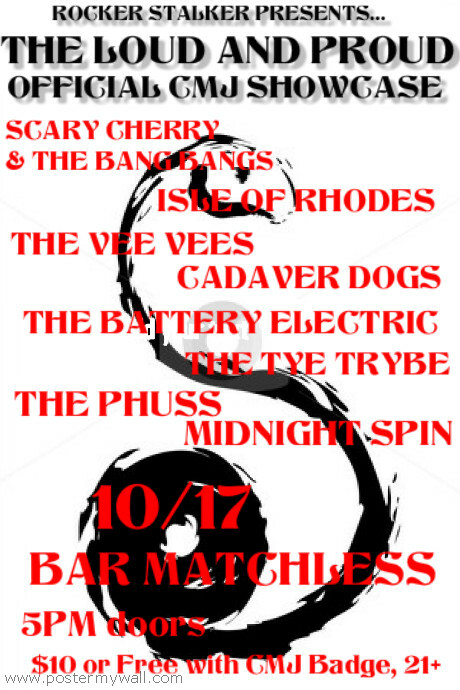 Thursday, 10/17, Rocker Stalker is back at Bar Matchless, this time for the “Loud and Proud” CMJ showcase with some evening shenanigans and debauchery brought to you by Scary Cherry and the Bang Bangs (TX), Isle of Rhodes (NY), The VeeVees (NY), Cadaver Dogs (OH), The Battery Electric (NJ), The Tye Trybe (NY), The Phuss (TX), and Midnight Spin (NY). Come rock from 6pm-12am! Invite your friends here. The Rocker Stalker finale takes place on Saturday, October 19 at SPiN New York in Manhattan (Fun fact, this club is owned by Susan Surandon.). 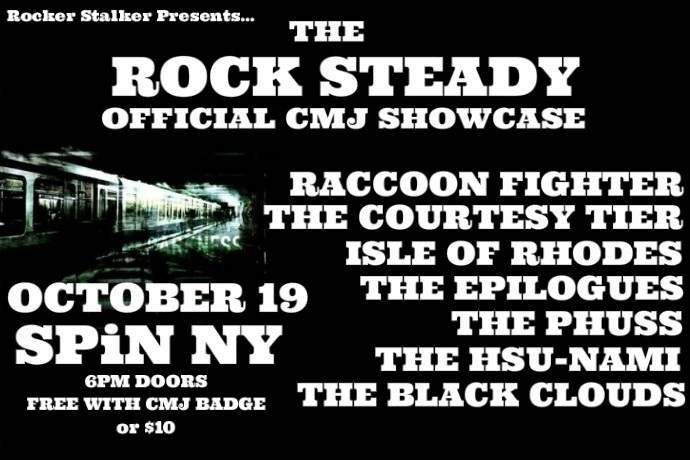 The “Rock Steady” CMJ showcase keeps the andrenaline going with Raccoon Fighter (NY), The Courtesy Tier (NY), Isle of Rhodes (NY), The Epilogues (CO), The Phuss(TX), The Hsu-Nami (NY/NJ), and The Black Clouds (NJ). Come close your CMJ the right way! RSVP here!